During his time in Nuenen, Van Gogh produced a series of paintings and drawings based on peasants, which he called “Peasant character studies.” This became a significant phase of his artistic career. We pride ourselves in recreating the most authentic reproductions of Van Gogh’s work. Our team of painters create accurate hand painted recreations of his paintings. 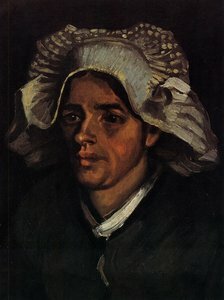 They have studied all of Van Gogh’s techniques including brush strokes, colour mixing, rhythm of ambience, and impasto. After moving to Nuenen, Van Gogh extensively started working with peasants and painting them. This part of his work became something that he referred to as “Peasant character studies”. During his time in Nuenen, Van Gogh fell in love with a woman known as Margot Begemann, the daughter of one of his neighbours, but also ten years older than him. When they proposed to get married, Margot’s father staunchly opposed the union. In response, Margot tried to poison herself, and was only saved when Van Gogh rushed her to a nearby hospital. This was the time when Van Gogh actually produced work that was becoming visible publicly. An art dealer from Paris was looking for paintings to display in an art gallery, and Theo convinced his brother to display some of his paintings so that he could gain recognition. Although this period of time was not something Van Gogh is particularly known for, it was a time when Van Gogh was actually of stable mind. He worked tirelessly to produce his work, and the romance between him and Margot also kept him somewhat happy. 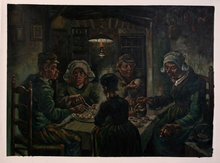 The darker tones in his work reflect that he was still experimenting with his technique, and refining it so that it would be accepted by the community, through impressionism. This marked the beginnings where he would flourish as an artist trained in post-impressionism. Why accept posters or prints instead of an eye-catching oil painting that is sure to beautify your home? Get this oil painting that will not only beautify your office or home but leave an indelible mark.